We provide state of the art specialized personal care for every critical patient on 1:1 basis nursing service supervised by trained NICU doctors 24 hours a day, 7 days a week. 24 hours supervision underguidence of highly trained consultant with 10 years overseas experience in NICU. 24 hours presence of NICU doctors. 24 hours trained nursing staff for each individual patient(1:1 ratio in level lll). Hi-Tech vital sign monitor for every baby. Invasive & non invasive Haemodynamic monitoring system. Transilluminator for detecting pneumothorax and management accordingly. Instant ABG analysis and electrolyte assessment. Modern incubator – (Giraffe) and also radiant warmer and incubators. Portable X-ray machine within NICU. Level lll – Managing very sick and pretem babies, also providing ventilator and CPAP facilities. 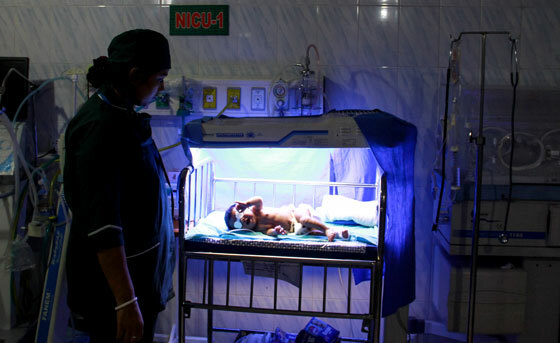 Level ll – HID facilities for managing sick newborn. Level l – Management of neonatal jaundice providing phototherapy, management of infants of diabetic mother & routine checkup of well baby. Different modalities of modern phototherapy units including single, double and intensive phototherapy facilities. Biliblanket for reducing jaundice in preterm babies. Facilities for exchange transfusion in newborn.